It's wings AND a lightweight drawstring back pack AT THE SAME TIME. I made this with convention cosplay in mind. Drawstring backpacks are my favorite way to carry things when I am in costume if I don't have a back or purse that matches my costume, because the strings are slim and subtle and the bag isn't bulky or heavy; it hides well in photos. 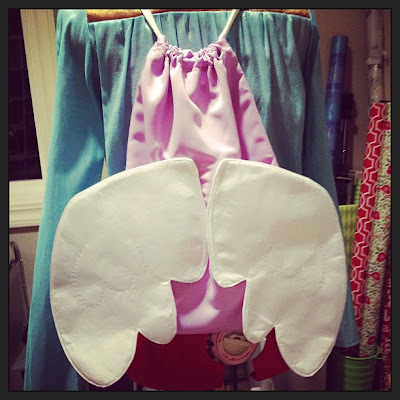 Then I figured, why not take it one step further and make it a part of the costume by sticking wings on it? Viola! Instant cosplay for any cute dress.